Among the multitude of manufacturers in the bath and kitchen industry, a few young brands have already earned a perfect reputation and proven to be able to compete with the oldest companies on the market. Danze is one of such brands. Unlike Kohler and American Standard who have been leaders among the producers of bath and kitchen fixtures for over 140 years, Danze is a young company that appeared on the US market only at the beginning of the millennium. Danze’s credo is “fun and playful”. They have an optimistic view of the world and do their best to enliven the dull and boring marketplace. They think outside the box and choose unusual design and creativity as keystones of their job. Danze is aiming at finding new opportunities and fresh decisions that have not been made before. They like being different and freethinking as it wins them the love of many customers throughout the country. The company’s crew includes a number of talented designers who create original and ingenious projects, paying special attention to the combination of a beautiful style and high quality. Other professionals make everything possible to produce goods that will meet the varied needs of modern customers. Danze is among the brands that care about the environment greatly. They can proudly be called one of the most eco-responsible manufacturers of bathroom and kitchen equipment. Water conservation is one of their main concerns. Many of their showerheads and faucets have earned the WaterSense label. These fixtures demonstrate high water efficiency without sacrificing the flow. All Danze’s produce can be arranged into two large categories—bathroom and kitchen. Bathroom products include faucets, toilets, sinks, vanities, shower trim kits, showerheads, tub spouts, shower valves, and such accessories as slide bars, shower baskets, shower arms, metal hoses, and soap dishes. Among Danze’s kitchen goods are pull-down/pull-out faucets, single handle faucets, two handle faucets, dual control faucets, hands-free faucets, bar faucets, pot fillers, and kitchen plumbing accessories. Their products come in three different styles—contemporary, traditional, and transitional. Danze was introduced to the US at the beginning of this century—in 2001, to be more precise. Starting with the first days in the industry, the company’s members did their best to brighten up the market. Very soon, their work bore its first fruit and by the end of 2002, Danze could offer more than two hundred unique products to the customers. The same year, the company launched the Opulence collection, every model in which came in five different finishes. 2003 brought with it the introduction of the Parma collection that remains the most popular even today. In 2007, the faucets from this collection were even named Best Luxury Products by Custom Builder. In the following years, the brand greatly extended its line of products, adding such fixtures as pull-down/pull-out faucets, thermostatic valves, high-efficiency toilets, water-saving showerheads, and showerheads with the air-injection technology. In 2011, the company’s designers introduced an original finish, Tumbled Bronze, which won the favor of the consumers almost instantly. This finish was quickly adopted by many other manufacturers, mainly due to its popularity but also because of its unique look. Today, Danze remains true to its main principles, namely high quality and creative design. Recently, the brand has refreshed its identity, launched a new logo, and created a website to be in step with the time. The company’s professionals never cease to amaze their customers and rivals, finding ever-new design decisions and functional choices. This showerhead has an interesting shape and an unusual design. It comes in a bell shape with a sleek brushed nickel finish. With the diameter of ten inches, it is extra-large for the utmost comfort of use. 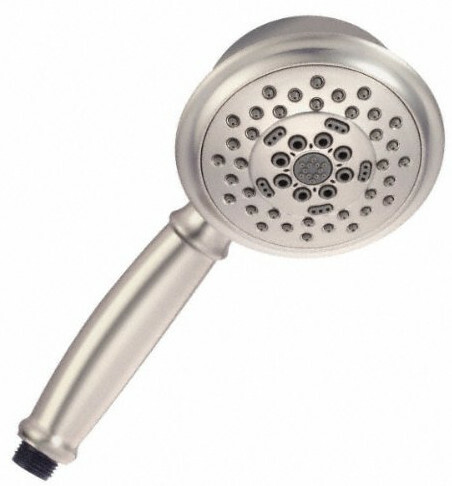 The showerhead contains 140 nozzles for an invigorating showering experience. The brass construction of the Antique Bell showerhead offers great durability thanks to the rustproof quality of the alloy. This model comes with an adjustable metal ball joint so that you can position the showerhead in the most comfortable way for your height. 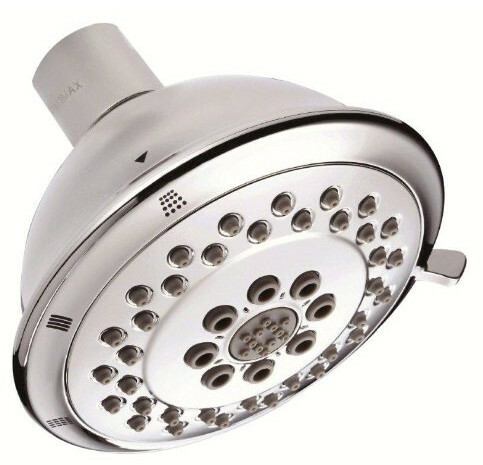 This showerhead will be a great choice if you are bored by standard one-function models. It comes with multiple spray settings to suit the needs of even the most demanding customers. Its five water supply modes include wide, center jet, aeration, massage, and the combination of wide and center jet spray options. 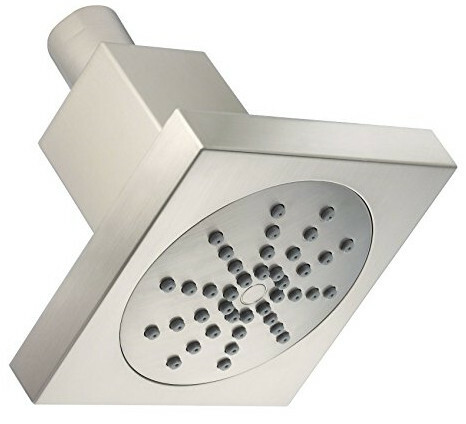 The Five-Function shower head is a handheld shower that can be attached to the hose or fixed to a shower arm, whichever option you find suitable. It comes with easy clean jets to offer effortless easy cleaning. This model will be a great choice if you have low water pressure, as it proves very helpful for optimizing the water flow. This is one of Danze’s WaterSense labeled showerheads. It will be a great option if you care about water conservation, whether for the sake of our planet or just to save some money on the water bills. With this showerhead, a family of four can save up to more than thirty gallons of water per day. It is available in three water flow rates, 1.75 GPM, 2 GPM, and 2.5 GPM. Apart from its water-saving capability, the Boost showerhead can offer an elegant design and practicality. It is available in three finish colors, brushed nickel, chrome, and oil rubbed bronze. This model features three functions—wide, center jet, and aeration spray—and a faceplate containing separate nozzles for each spray setting. 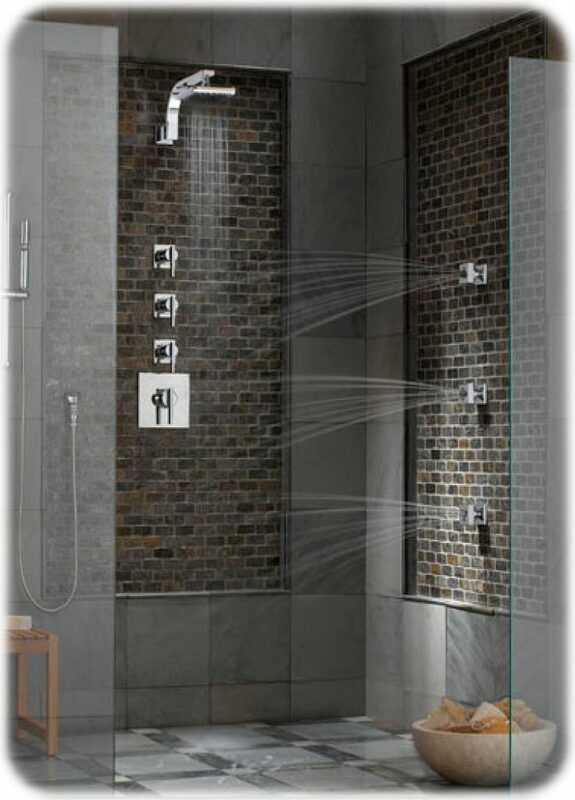 The unique design of this showerhead will impress even the most demanding customers. It will be a nice option for those who like sharp angles and strict lines. This model comes with a square body and a round faceplate with nozzles on it. It features the Air Injection technology that offers a soothing spray that, nevertheless, provides excellent water coverage. 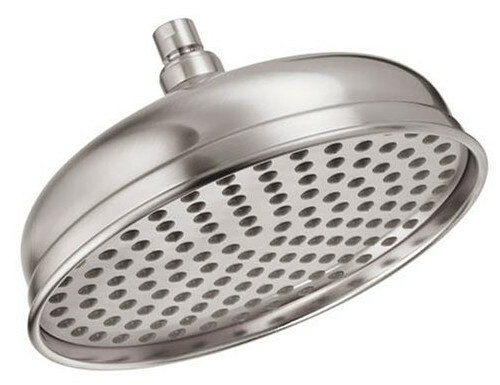 The Parma Square showerhead comes in two most standard finish colors, brushed nickel and chrome. Like most Danza showerheads, it is equipped with easy clean jets. This single-function model can offer a steady downpour spray effect that will give you a boost of energy, be it in the morning or after a hard day at work. 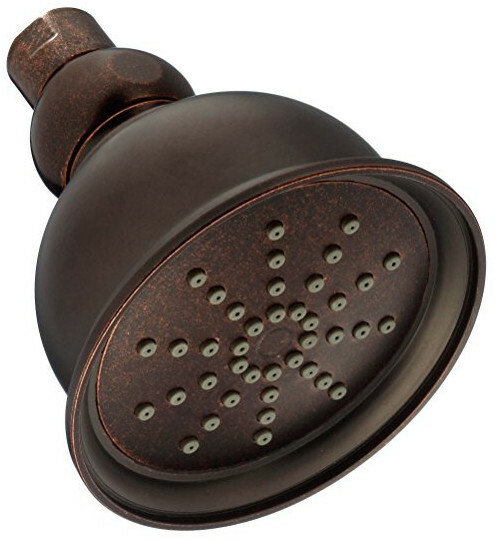 This stylish showerhead will add a special vibe to your shower area. Thanks to the multitude of finishes, you can find a perfect match to complement the décor of your bathroom. You can choose out of five available options—brushed nickel, chrome, oil rubbed bronze, polished nickel, and tumbled bronze. The Eterno showerhead comes with only one function, which makes it a perfect choice for those who just want to enjoy a good shower without any extra features. The entire body of this model is made of high-quality brass to offer reliability and fault-free performance.